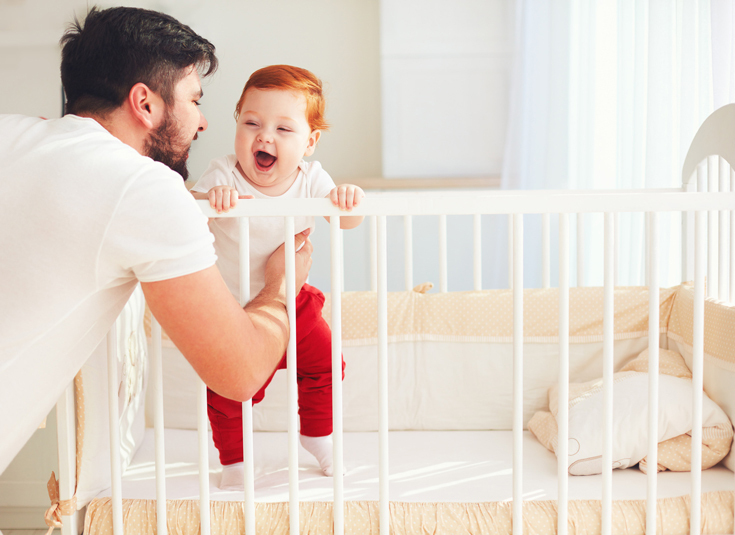 Like many first time parents, when my husband and I were pregnant with our first, we SWORE that no baby, toddler or child would ever enter our bed. We equated good parenting with a kid-less bed and knew all too well the horror stories of nights of sleep ruined by flailing arms and legs. Then our oldest was born. She was colicky…except worse, because colic usually dissipates around 4 months and she kept crying for a good 8 months. The only reprieve was at night…I quickly found that if she was snuggled in next to me in bed she would sleep…like a baby. She would nurse a few times throughout the night and quickly settle back into sleep. It was like she was a different baby. At first I worried about her safety (although a “co-sleeper” like this helps with that: Arm’s Reach Co-Sleeper Bedside Bassinet –this is the one we have and I LOVE it!) and of course I worried about WHAT OTHER PEOPLE WOULD THINK! But, I was still working full-time and was so desperate to sleep, I no longer cared. What I didn’t expect to find, was that I would really enjoy having her in bed with us. I loved the snuggle time and knew that it was just for a season…soon she would be older and it would be different. So instead of it being an inconvenience, like I would have originally imagined it, it became a sweet time of connection for us. However, I really thought it was going to be nearly impossible to get her out and imagined long sleepless nights battling her desire to get back in our bed. She was still waking to nurse at least once during the night (although, I knew by this age she no longer needed it, it was just a habit and comfort) and rarely napped in her crib. We did not have much going for us. So one night, just after her first birthday, I went to a women’s event at church that went past nine. My husband was going to have to put her to sleep which would be unusual, at this point I was still nursing her to sleep at night (again, nothing going for us!). When I came home I looked around for the baby. I expected her to be asleep on him or in our bed. Nope, she was sound asleep in her crib. He had given her a bottle, bounced her for a few minutes, and then laid her down in her crib, still awake but drowsy. Huh? Like in the books!?! And she went for that!?! She didn’t go to sleep right away on her own, but he rubbed her back until she fell asleep (she preferred to sleep on her tummy by this point). We hadn’t discussed sleep training methods…cry it out, no cry…we just agreed to take it one night at a time, and that night we were going to try really hard to stick with it and we would take turns getting up with her. So when she woke around midnight, I got up, picked her up until she stopped crying, and then laid her back down on her tummy and rubbed her back until she fell back to sleep (and it worked!!!). Around three o’clock my husband got up and did the same thing. And then she slept until six when she normally was awakened to go to day care. And we did this the next couple of nights. Nights two and three were more difficult. The excitement had worn off and for me, it was difficult not to just grab her and bring her in bed with us. But it paid off, and after three nights she was only waking once during the night. As much as I loved co-sleeping, and wouldn’t have done it any other way…her sleeping had been a stressor for me. Many nights, I would lay down in bed with her to nurse her to sleep and I would fall asleep, too. My husband didn’t appreciate that. Plus, at one year, we had NEVER left her with anyone else over night…I didn’t think it was fair to leave a baby that basically relied on me as her own personal sleep aid. 1) Husband (or significant other) led sleep transitioning: Now at the time, my husband wasn’t exactly “Mr. Mom.” He had been working really long hours so I took on the brunt of our baby’s physical needs, including sleeping. However, we quickly noticed that when my husband put her down to sleep for the night or got up with her in the middle of the night, that she went back to sleep much quicker. So, if there is someone else in your household who could assist with this process, it could be helpful. 2) Keep the crib in your room: During our transition we just happened to have our daughter’s crib in our bedroom (even though it had never been used!) because we were remodeling. However, this turned out to be really helpful. We were more likely to stick with our plan if we didn’t have to get up and go all the way down the hall to her room, and then stand outside the door and make sure she was back asleep before returning to our room. It worked great and we’ve kept all of our babies in our room until around 18 months now. 3) Respond quickly: Unlike other methods of sleep training that suggest waiting 15 minutes to respond when they stir at night (although we did use the waiting method later on, once they had adjusted to their crib at night and for nap times), I felt that I should let her know right away that we were still there. Since she was going from a shared bed, where she could reach out and touch us any time, I wanted her to know that we were still close by and ready to respond to her needs. So as soon as I would hear her start to wake, I would get up and rub her back and “shhh” her…most often she settled right back in before really waking or standing up. We did this two or three times the first couple nights, but after that she was only waking once per night. 4) Consistency is king: As with all things parenting, consistency was the key to our success. Oh, of course there were a couple nights where she ended up back in bed with us over the first month (usually around 4:30 in the morning–so if you mess up, don’t worry, you can get back on track! ), but 95% of the time we were consistent with keeping her in her own bed and it really paid off. I was glad my husband had taken an interest in it, because I don’t know that I could have done it on my own. At 2:00 in the morning, when it feels like you have been woken up in the dead bottom of a sleep cycle, you aren’t thinking as logically, you are just thinking about how to get back to sleep as quickly as possible! 6) Pick the right time: Starting a new routine might best be done on a Friday night, heading into a weekend when you have no evening plans. Much like potty training, we’ve found that dedicating a few days to this is really helpful. Also, choose a time when you don’t have other things placing large demands on your time or energy. Going back to school, working long hours, caring for a loved one…these all require massive amounts of emotional energy…adding new sleep routines into the mix may not be the best idea. I also learned a lot from my first to my third when it came to nap time. Our third was taking 3-two hour naps a day from 4-10 months and now at a year takes 2-two hour naps a day. This article was really helpful for getting him to nap well and knowing when he should be hungry and when he is probably just tired. While we didn’t subscribe to her principals for night-time sleep because we had decided to co-sleep, it worked great for naps (in his own crib :)! And in the end, do what is right for YOU. Remember, there are no hard and fast rules when it comes to sleeping and co-sleeping (as long as you are doing it safely). In all of these parenting decisions, I believe that the most important thing that we can do is love our children, affirm them, and teach them how to be respectful and responsible. The rest? Well you could find reputable scientific data to support either side…trust your intuition, and do what is best for you and your baby. Its been a few years since I originally wrote this post and I wanted to update it based on a few things that we did differently with our last two babies. You can read about it here! Do you have any tips for success? Or any questions? Please share below!